After Jurie helped Lili with a flat tire, she invited him to dinner. Sparks flew, igniting a powerful romance whose wedding could only be held at BCIT’s Burnaby Campus. 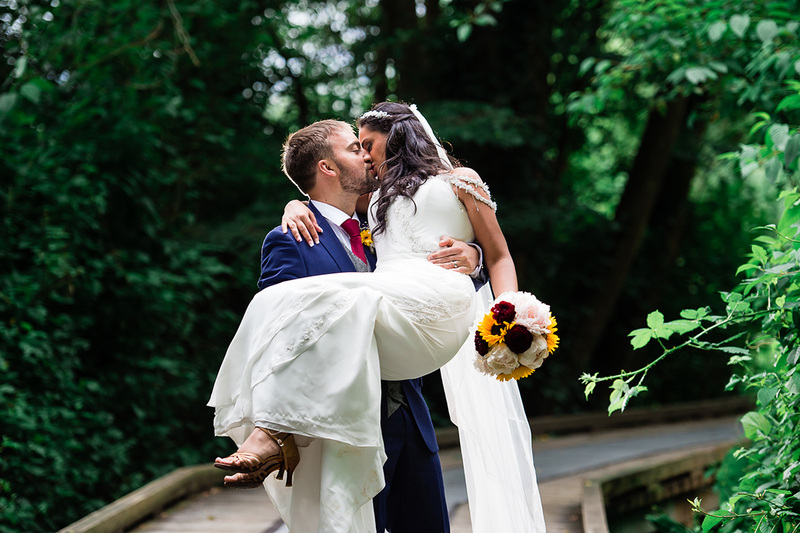 “We thought it would be a unique and an amazing experience to have our wedding at a location that means something wonderful to both Lili and me,” says Jurie Human about their choice to host their special day at BCIT. On June 30, 2018, they were a picture-perfect groom and bride. 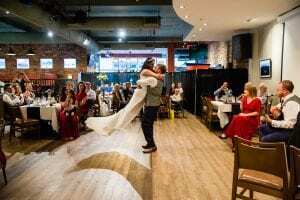 Jurie and Lili were all smiles as they exchanged vows in the BCIT Student Association (BCITSA) Council Chambers—he in a natty blue suit, gray vest, and burgundy tie, and she in an off-the-shoulder gown and floor-length veil. 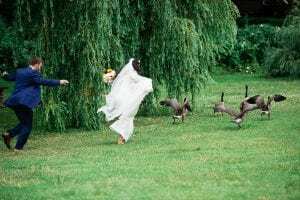 After the ceremony, guests were treated to coffee and pastries from The Stand stores (BCITSA owned and operated) while the wedding party travelled by limo bus for photos, some of which included familiar BCIT fixtures like the campus’ resident geese and Guichon Creek. After that, guests continued the celebration at a sit-down dinner reception at Habitat Pub. After dinner, Lili and her bridesmaids surprised everyone with a choreographed dance. Just like their romance sparked when Jurie helped Lili fix a flat tire, the couple’s relationship with BCIT began with a desire to better their circumstances, and, ultimately, to move forward on their road to success. Congratulations to the newlyweds on choosing BCIT for their careers and on getting married. This may not be the last we see of the couple’s celebrations on campus. Jurie jokingly hinted a golden anniversary bash on Burnaby Campus isn’t out of the question. Photo credits: Frank Wang Photography | Photos (top to bottom): At Guichon Creek, with resident geese on Burnaby Campus, dancing the night away at Habitat Pub. OMG! A time machine phenomenon. Chivalry and romance is alive and well. Congrats to my colleague Lili and Juri. May their life’s journey be free of potholes.